The key to watering and fertilizing catasetums is understanding their annual growth cycle. New growth begins to emerge in the spring from January through March. By mid spring, the plant will start growing incredibly quickly through the summer into fall. It is trying to achieve a year's worth of growth in 6 to 8 months, so it needs copious amounts of water and fertilizer. Then in the fall, the growth begins to slow and enter its dormancy period where the plant leaves yellow and drop. At this point, you will restrict all water and fertilizer, total ignoring your plant until next year's spring growth cycle. Watering During the Growing Season. Catasetums will benefit from copious amounts of water during the growth period. Depending on your potting mix and the weather, you may water them every one to three days. Catasetums do not want to sit in a soggy medium, in part because this would restrict air around the roots. The plants should be watered, allowed to approach dryness and then be watered again. Fertilizers and Supplements. Catasetums are heavy feeders during the growing season. You can supplement the time release fertilizer you added to the potting mix with water soluble fertilizer you use on the rest of your plants. Use a dilute solution, say 1/8 to 1/4 strength. You can fertilize with every watering and flush with plain water once or twice a month to remove residual salts. The catasetums will benefit from supplemental calcium and magnesium as well as organic products like fish emulsion and seaweed extract. Preparing Plants for Dormancy. In the late autumn the plants will begin to enter the dormancy phase. 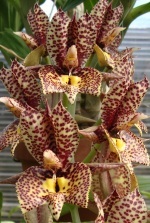 This is often sometime after flowering, though there are many catasetums that bloom on leafless pseudobulbs, notably those with Clowesia influence. The onset of dormancy is caused by several factors, the maturity of the pseudobulb, shorter day length, cooler day/night temperatures and a reduction of root zone moisture. 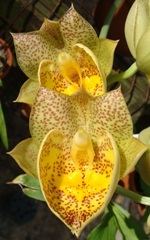 The plant will tell you it is beginning its dormancy period by yellowing and browning of the leaf. At this time, you should stop fertilizing and cut back your watering by half. Once the majority of leaves have dropped, restrict all watering. A safe rule of thumb is to restrict water and fertilizer after Thanksgiving. Winter Care. Winter care is a breeze, don't do anything! Don't allow them to be exposed to temperatures below say 55F. Don't water them. Don't fertilize them. Some people take them out of their pots, cut off their roots, tag them and throw them in a shoe box. Better yet to find a secure place where you won't forget them, leave them in the pots and just ignore them until January or so. Note: Watering during dormancy should only be done it the plant shrivels severely. 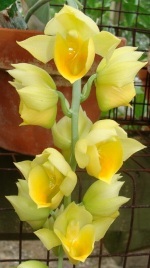 Usually a single irrigation is sufficient to restore the bulbs.